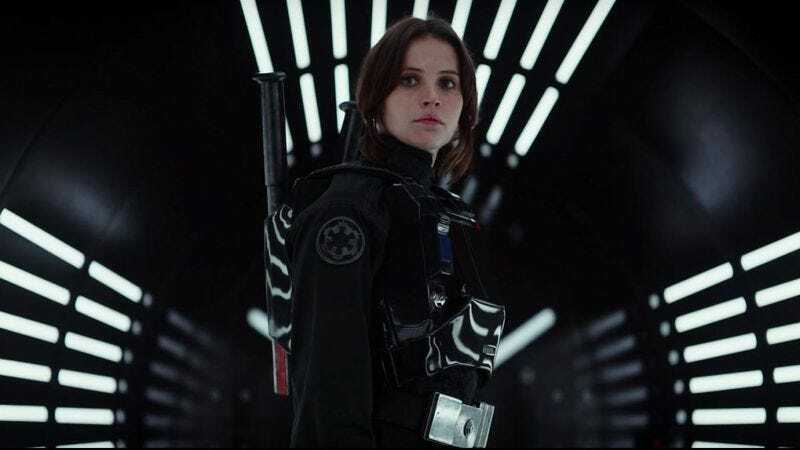 Mads Mikkelsen got a little ahead of things back in April when he revealed that he’ll be playing the father of Felicity Jones’ character in the upcoming Star Wars spinoff Rogue One. But now that he’s jumped the proverbial blaster, Star Wars fans have become even more curious about who everyone else will be playing. Luckily, they don’t actually have to wait for the movie come out to get information like that, because a site called Edelweiss that catalogs upcoming releases from various publishers actually posted a bunch of preview images from the “Official Visual Story Guide” for Rogue One. This comes from Jedi News, which managed to grab the images before they were sucked into the internet’s trash compactor (you’ll have to click that link if you want to see them for yourself). There are only a few pages, but they still reveal quite a lot of stuff about Rogue One that we didn’t know before. In other words, that’s your last spoiler warning. First up, there are two new ships that the Rebel Alliance and Empire will be zipping around the galaxy in: The U-Wing fighter and the TIE Striker. The former looks about how you’d expect a Star Wars ship called the U-Wing to look, while the latter is the classic sort of TIE Fighter variation that used to pop up all the time in Star Wars video games, which is to say that it looks like a TIE Fighter but with its wings in a different spot. Given how secretive Disney has been about Rogue One, though, the real exciting stuff from these leaked pages are the descriptions of the movie’s primary characters. Of course, the pages do say “Not Final” many times, so there’s a chance that even this information is wrong or just straight-up fabricated, but we won’t know that for sure until Disney says so. Anyway, we already met Felicity Jones’ Jyn Erso in the teaser trailer, but now we know that she’ll be joined by Diego Luna’s Captain Cassian Andor, Jiang Wen’s Baze (“a freelance assassin”), Riz Ahmed’s Bodhi (a renegade surfer, hopefully), Donnie Yen’s “spiritual warrior” Chirrut, and a pair of aliens named Pao and Bistan. Also, Alan Tudyk will be playing K-250, the droid that popped up a few times in the teaser, and Ben Mendelsohn’s Imperial bad guy will be a “military dictator” named Director Krennic. Finally, the pages don’t confirm that Darth Vader will make a cameo in the movie (as has been rumored for a long time), but his presence literally looms over the other characters in these previews, so he’ll almost certainly make an impact of some kind.